Writing an effective CV can be one of the hardest tasks you’ll face after leaving education. Even a job seeker who has many years of work experience can still make lots of mistakes and struggle to make the interview stage with ease. The overall layout and presentation of your CV does matter – and although some employers don’t worry about it as much as others, it will still affect your chances of getting an interview. This doesn’t mean however that you should take the chance that the employer you apply to will not fuss over your bland black and white CV. One of the most common mistakes a job seeker makes when writing a CV is to put all their efforts into the content. Whilst this may mean the quality of the CV is high, it will only appeal to certain employers. Having this type of hit and miss approach to creating a CV could have a negative impact on your chances of getting an interview. At the end of the day, an employer will not reject your CV if it looks amazing AND contains everything they want within it. 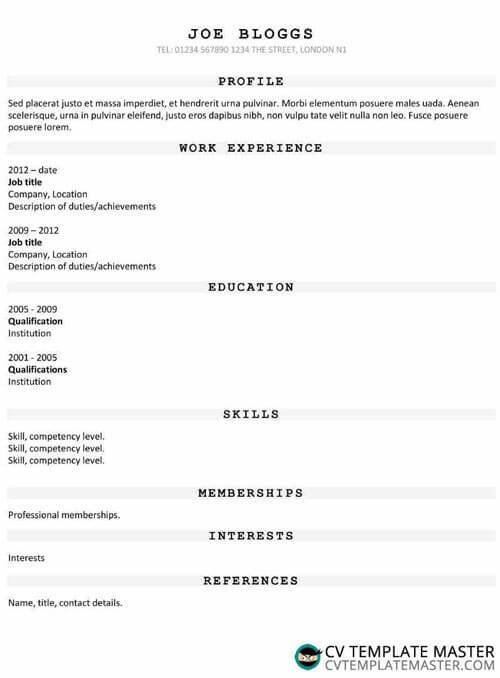 One of the best ways to ensure your CV looks great and contains all the appropriate sections is to use a CV template. A CV template removes all the stress and hassle of having to create one yourself, and when our in-house team of experts have done all the hard work for you, then why choose any other way. There are literally hundreds of CV templates to choose from, and some have even been created with a specific role and industry in mind. Finding the right one for you should be easy, and will allow you to focus on writing a CV without having to worry about anything else. This website has close to 200 templates, none of which require you to give them so much as your email address. If you go back a few years, before websites like ours offering CV help and templates were born, you’d find job seekers all over the world using the same CV to apply to different employers. It didn’t used to be a problem, but since the internet took off and helpful and free websites like us were created, employers are now seeing a huge increase in the quality of applications. But what does that mean for the job seeker? It means that you can’t settle for second best! Writing a tailored CV is a far better approach, as it will aim to point out how you are the right person for the job. A generic CV will only showcase your talents, but a well tailored and custom written CV will link your skills and qualifications to the role and the company. "Doing your research is the key to creating a CV that shows employers you really want to work for them". The hiring manager shouldn’t have to cherry pick all the best bits of your CV to see if you are the right fit for the job. You should be doing that for them by scrutinising the job advert to see which boxes need ticking. Everything on your CV should be relevant to the role, and if it isn’t, then consider if it needs to be there at all. This might apply to hobbies, skills, qualifications, and even work experience. But be careful not to have any employment gaps, and instead look to minimise the level of detail you go into for a role that isn’t relevant. Both the look and content of your CV is important to an employer. Not only does your CV need to tick all the boxes as far as skills and qualifications go, it also needs to be presented professionally. The CV is ever evolving, and with a little injection of colour and creativity, you could be seeing a much higher success.